Is your LED bulb blinking too fast? No worries—it’s an easy fix! LED lighting draws much less power and lasts way longer than standard incandescent lighting that comes stock with most vehicles. Although the reduced draw of LEDs has advantages, replacement of turn signal bulbs with LEDS will cause what is called hyperflashing. Hyperflashing is when the turn signals blink faster than your stock incandescent bulbs did. This happens because your new LED bulbs draw such little power that your turn signal relay sees the bulbs as being out. Installing an LED flasher module specifically designed for LED bulbs. This is the easiest method for f ixing hyperflashing. 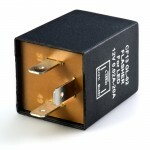 These modules are economically priced and are usually simple to install. In most cases, these flasher units are little circular or square boxes with metal prongs sticking out one side that simply plug into where your stock flasher went. Our LED flashers function with both LED and incandescent bulbs, so even if you have LED turn signals in the back and incandescent bulbs still in the front, you can use our LED flasher modules with no problems. Before you order, compare the pin diagram of the stock flasher with the pin diagram of our flashers on our website. I have a 2015 Chevy Silverado 1500 crew cab and I have hyper-flashing with my newly installed LES turn signals. Will the flasher module solve my problem? I have a 1986 buick regal grand national and I want to change out the tail light bulbs to led, do i need anything else besides the less for the taillights? I have 1999 Chevy S10. I installed load resistors on the front and back turn signals and the bulbs are still hydroflashing! What can I do to fix that? Ryan, would you mind giving our tech support a call toll-free at 866-590-3533 anytime between 8:30 AM and 8:00 PM CST (4:00 PM on Fridays)? We’d like to get a few more details about the issue you’re having and help you out. Thanks! Ryan did you ever get this issue resolved having the same problem on my 08 ram? Does your car already have Angel Eye headlights or are you looking to add them? I have a Dodge Ram 1500 with tail lights LEDs bulbs and experiencing the same symptoms of hyper flashing. Now I read that I can use either flashing relay or resistors to correct the issue, but my concern is would either fix affect a trailer service lights hook up or a trailer with regular regular lights bulbs? This should not interfere or affect the normal use of the trailer as harness as intended. It is all on the same blinker, brake light circuit, etc. The trailer harness is just mirroring what the vehicle lights do. When you add resistors in, really what you are doing is putting back the missing current load from the normal bulbs. This puts a normal current amount back through the flasher relay coil, letting it heat and cool at the correct rate, thus correcting the hyper flash. In effect with the new LEDs and resistors added, its really no different that the load of the normal bulbs. You should be fine here. I hope this helps! My right blinker is flashing fast. I know to replace bulb, but which? Front or back? You would replace whichever bulb is flashing. You would replace whichever bulb is flashing. If you plan on replacing it with an LED bulb, you’ll either need to install a flasher or a load resistor. I have a cadillac cts 2003 and I want to change out the signal light bulbs to led, do i need anything else besides the less for the taillights? To prevent hyperflashing, the new LED bulbs would require load resistors. If you don’t want to go this route, you can replace your flasher with an led electronic flasher in your fuse box. Please compare your flasher to our flashers online to determine the one needed for your vehicle. I have a 2011 F 150 . I put in LEDs and have hyper flashing. Does my truck have a flasher I can change or do I have to use the resisters. I also have a 2011 F150, mine has the whole assembly with resistors. Plug and play. The turn signals still hyperflashing. Are the load resistors warming up after the turn signals have been on for a few seconds? They should warm up and if they do not, there is a poor connection preventing the full electrical connection. A load resistor or a flasher would fix this, yes. My front turn signals hyper flash only while my headlights are on. Resistors are installed, they do heat up so know have connection. Once headlights are off, no hyper flash!! Help! What type of vehicle are these LEDs installed in? Hey pal, I have the same issue, what was ur fix? I have a 2013 Ford Focus sedan. I want LED brake light bulb that replace 3157. I know I will get a bulb out error unless I install a resistor. Do you have NO error LED’s? Jason, you’d have to check with your car’s manual as our Vehicle Bulb Finder does not have that information. I have a 2002 Ford e-150. I installed led brake/blinkers in the rear, and turn signals in the front. They will not flash at all with stock flasher relay, four way flashers will work with the stock relay but these hyper flash. Nothing functions with the LED flasher installed. Is the flasher unit bad or something else? There may be an issue with your flasher. Which one did you purchase from us and what is the number of the stock flasher you had? We can check to see if you have the correct flasher. When you installed our LED bulbs, did you install load resistors on each turn signal bulb as well? I have a 2012 Ram 1500 and installed 3157 LED bulbs in the front as a pair and in the rear as well as a pair. Would I need a flasher for this year or have to go with a resistor? Also would I need to install one for each? For that year of truck, you would have to install load resistors. We do not have a replacement flasher for your vehicle. I have a 2016 Traverse. I don’t understand what flasher to replace with a led module. I have a right turn signal flasher and a left. Do I have to replace both or just the parking lamp flasher? I bought the HP24D dual color turn signal/running lights bulbs. You would have to replace both flasher units, or else one side will work properly and the other will hyperflash. I have a 2005 F-150 with LED bulbs and have hyper flash, will a LED flasher Module fix the problem, NOTE: I tried the Load Resistors did not work! So I want LED Flasher Mod. ? You would need a flasher. Unfortunately, we do not have any cross reference information to tell what flasher you would need to replace your stock flasher. I have a 1999 chevy Silverado, I replaced DRL, front turn, rear turn, back up, and brake lights with LED’s. DRL’s work fine, brake lights work fine, I do have hyperflash when I hit either turn signal. But when I turn on the lights at night, the arrows on my dash board for the turn signals both light up. Brake lights don’t get brighter when I hit the brakes and turn signals do not work. All bulbs are 3157 LED, Except front turn signal those are the amber 3157. Do I need to install resistors? A turn signal switch won’t fix the brake problem. Yes, installing load resistors should correct your issues. I have a 2011 Toyota Tundra and my turn signals are hyper flashing both left and right. All the bulbs are working. I recently purchased it used and not sure if anyor all of the bulbs are LED or incandescent. If the LED bulbs are causing the hyper flashing would your model module solve the problem? 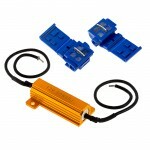 Unfortunately we do not sell a flasher for your vehicle, load resistors would be your only option. I would like the part number for a turn signal flasher for a 2009 Ford F150. I purchased the 3157A bulbs and now get the hyper flash. Thank you. We don’t offer a replacement flasher for that vehicle, unfortunately. You would have to use a load resistor on each bulb. Do you have a replacement flasher for a 2016 Traverse? Unfortunately, we don’t offer a replacement for your vehicle. I have a 2006 Scion tC, will the flash module work on my car to correct hyper flashing? Hyper flashing only occurs with the front and rear turn signals. I have LEDs in parking lights, stop lights, side markers and reverse lights. The load resistor DIYs on YouTube look like a lot of work for such a small mod. CF 18-08 LED Bulb Electronic Flasher is apparently my answer and on my car, Gen 1 Scion tC, you just need to remove a small panel under the mirror controls by my left knee. My 2009 IS 250 has a halogen front turn signal, an LED side turn signal, and a halogen rear turn signal. If I want to swap out the rear turn signal for an LED, do I still need a LED turn signal relay or a resistor, even though my side turn signal is LED? Yes, even if you go with LED bulbs in your turn signals you will still either need a replacement flasher relay or load resistors across each LED turn signal bulb. I have a 69 Mustang that I am looking at replacing the lights with LED’s. Will these lights you have work on a car that old? If so, do you have a kit for all exterior lights? I would suspect I would require the flasher as well…. Yes, LED bulbs will work on a vehicle even that old. A replacement flasher relay will be required for the turn signals. Unfortunately, we do not have any full vehicle kits. You would have to remove your original bulbs to see what is there and how many you will need to replace with LED bulbs. I have a Scion tC 2006 (1st Gen), purchased the CF 18-08 flasher module. I was able to pull out the old flasher module which is located behind the panel below your side mirror controls by your left knee. Getting the stock flasher module out is easy if you reach under the module and pull from behind. Another small note which nobody will tell you, you’ll need to cut off the small tabs on the LED flasher module that stick out past the end. If you don’t do this the module won’t go in all the way and none of the pins will connect. I was scratching my head over that until I figured those plastic tabs were useless on my 2006 Scion tC. I have a 1973 Z28 RS Camaro. What exterior bulb package would I need to replace all bulbs ex. headlights. Also will I need to replace the flasher module? Tnx. We don’t have bulb “packages” – you’d have to check our Vehicle Bulb Finder for recommendations. You will also have to either replace the flasher module or add load resistors. Will this work for my 2015 Jeep Wrangler sport? I just need a flasher module but I have no idea which one to get. You would want to use load resistors. I’d like to add LED turn signals to my 2009 Focus. Which electronic flasher would be correct for my vehicle? We don’t offer a compatible flasher for your vehicle. You’d have to use resistors. Okay, I’ve been reading all this posts and realize relays or resistors are required to stop hyper flash. I don’t want to use resistors and stay with the plug and play relays, so my question is this. I have a 2004 Land Rover Discovery HSE. I want to replace “ALL” exterior lights with LED’s I just need the blub and relay part numbers so I can order them. Thanks. I have a,1999 Dodge Dakota Sport I just purchased, it had led turn signals, and I switched back to stock. The left front turn signal will not work, but the rear turn signal which is still stock, hyper flashes. Would replacing the flasher relay get rid of this? Yes – either replacing the flasher module or installing load resistors would fix this. I replaced the tail lights/turn signal bulbs in my 2005 Dodge Grand Caravan with LED and I have the hyper flashing. Is this actually a ‘problem’ that needs fixing or it it just something people find annoying? What’s the downside to not ‘fixing’ it? This is an actual problem. It’s not illegal to have hyperflashing, but you may be pulled over by police to alert you that a bulb is ready to be replaced when it’s really not. It’s also possible you could start to have troubles with the electrical system due to the improper current flow. You would need to install the correct flasher module or load resistors to remedy this.